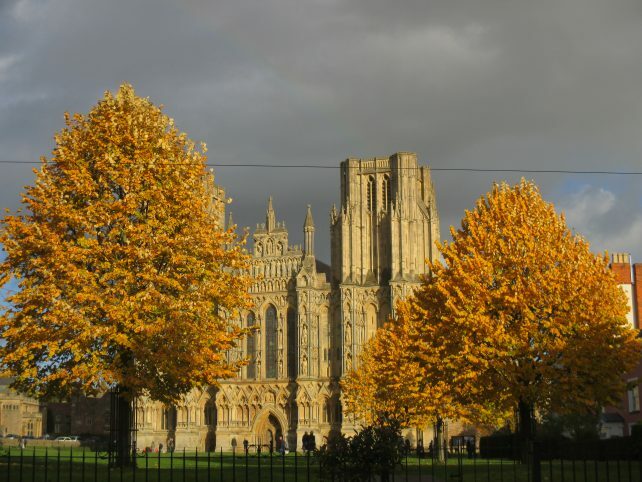 To my mind, Wells Cathedral is one of the most beautiful sights in Somerset (and the competition for this accolade is fierce!). 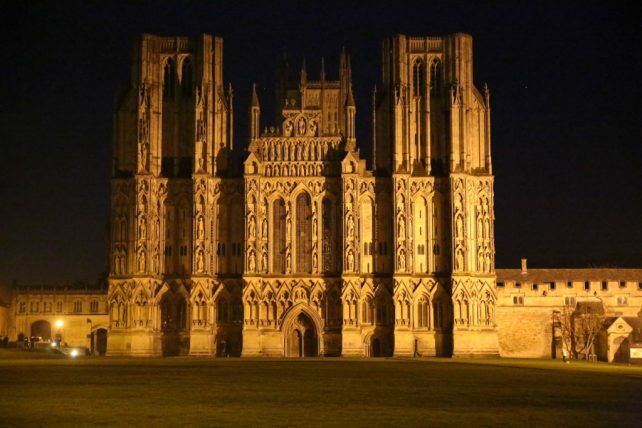 Situated just a couple of miles down the road from me, Wells Cathedral is one of the earliest Gothic buildings in Britain. If you stand on the Cathedral Green and face this incredible building, you will be gazing at carvings on the West Front of the cathedral which date back to the 13th century. The longer you spend looking at this facade, the more you will see. 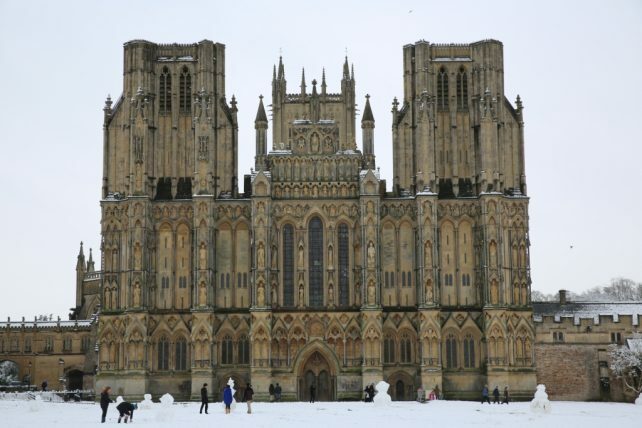 For the West Front of Wells Cathedral contains nearly 300 medieval sculptures in different ‘zones’. Today, these figures still look resplendent, but I wonder how they would have looked centuries ago? An extensive conservation programme was carried out between 1974 and 1986 and during the restoration works traces of paint were discovered. It appears that some of the carved figures may have been adorned with red, white, blue and green paint. There were also signs that some of the heads received a special coating of orange. (Perhaps seniority within the noble ranks helped to determine colourings!). Anyway, back to the present. While no-one alive today can be absolutely certain of the deeper meaning of the carvings on the West Front of Wells Cathedral, there is a consensus as to what many of the main figures represent and how the different areas are divided up. At the top of the West Front is a carving of Christ flanked by angels. Move your eyes down from here and you’ll see the Twelve Apostles. Next come the Nine Orders of Angels, followed by the Resurrection Tier. Then there is an upper and middle tier of life-size figures, the Biblical Quatrefoils and then the Demi-Angels. The lower tier contains other life-size figures. While the high towers on the West Front were added at a later date the figures detailed above would have been carved around 800 years ago. Amazing. 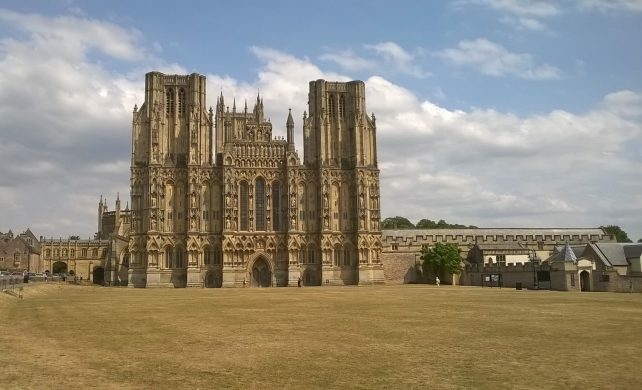 “Wells is one of the greatest collections of medieval sculpture in the world…” I couldn’t have put it better myself!